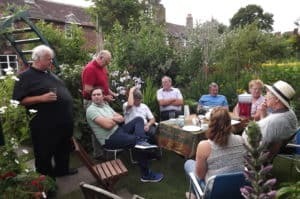 It had been a few years since we had an open day at the Chairman’s home in Telford, Shropshire, largely due to periodic water trouble causing heavy losses of young and older fish alike. Fortunately, 2017 proved to be one of the better years so the open day happened in glorious sunshine by the time some of the earlier visitors started to arrive after early morning rain. 21 of us managed to attend and apart from a leisurely inspection of the fish house and ponds there were Moors, Fantails and Bristol Shubunkins to be had for the those that wanted to purchase some excellent young stock.